Can you buy from Yahoo Auction Japan/Auction Sites ? Yes, we can help with purchasing from Auction sites. We accept orders for both Buy-it-now and Bidding auctions (see below for difference in auction type). As our bidding system is not automated we strongly recommend placing your high bid as the item price when placing an order. Waiting to adjust the bid until after the order is placed may result in losing the auction. Buying from auctions is the same process as normal online stores. Head over to our easy-to-use cart and add the auction URL, you’ll then be prompted to add information such as item name and price. Buy-it-Now Please enter the price above the red button that says “今すぐ落札する”. Bidding Please enter the maximum bid you would like to place. If the auction goes for less than that price we will refund the difference. If it goes for more we will cancel and refund the order. Once you add the item you will see your quote instantly with a breakdown of our fees on the cart page. We recommend always pre-approving domestic shipping for auctions. Buy-it-Now (BIN) auctions can be bought automatically with a set amount. We recommend using the Buy-it-Now price if it is within your budget. Bidding auctions have no set price and you can be easily outbid. White Rabbit does not currently have a live bidding service or a quick way to increase maximum bids. This is why we recommend putting your absolute maximum bid as the item price. Some auctions will have both a BIN and Bidding option. In both cases if the smaller number is not 0 (as shown to the right) you should input that smaller number as your minimum bid (if not bidding higher)/buy it now price. 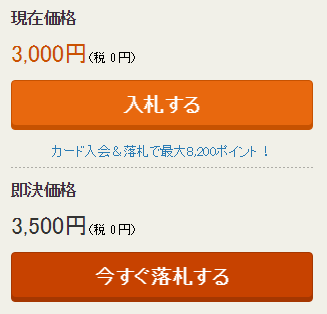 The smaller number shows the Japan Sales Tax inclusive price (not applicable for all sellers). How do I update my bid? If you are outbid we will alert you during business hours only. If you would like to adjust your bid please send a reply via your order page or initial confirmation email. Adjusting bids can take several hours due to time differences and our office hours. Because of this we strongly recommend placing your actual high bid when placing the order. This will avoid disappointment later in the process.